A Doctorate in Educational Administration degree online gives graduates the leadership and teaching skills they need to effectively serve schools and school districts as superintendents, principals, directors, specialists, and coordinators. A doctoral candidate in educational administration learns the leadership, technology, organizational, administrative, and personal skills necessary to lead an academic organization. As schools of all sizes–from kindergartens to colleges and universities to entire districts–work to educate students of all ages in the 21st century, effective leadership plays a crucial role. Individuals who complete a Ph.D. in Educational Administration find themselves prepared for successful careers as school administrators. Topics of study in an educational administration doctoral program include leadership, finance, entrepreneurship, technology, and ethics. This article ranks the 10 best online Doctorate in Educational Administration degree programs for those who seek to grow as educational administrators while enjoying the flexibility of online education. What is an Online Doctorate in Educational Administration Degree? What can you do with a Doctorate in Educational Administration Degree? What kind of job can I get with a Doctorate in Educational Administration and how much will I make? Are there professional associations or organizations for those with a Doctorate in Educational Administration? We selected the programs based on the quality of the program, the types of courses offered, the faculty, rankings, awards, and reputation, including the school's reputation for effectively providing online degree programs. University of Nebraska-Lincoln ranks #1 on The 10 Best Online Doctorate in Educational Adminstration Programs! The Department of Education Administration at the University of Nebraska-Lincoln offers a variety of graduate and professional programs for educators interested in becoming school administrators, with specializations in everything from pre-K to higher education. The programs lead students to study problems and find solutions facing 21st century schools, including class, race, gender, access, and equity. Housed in the College of Education, online learning plays a big role in the learning done in the Department of Education Administration, with a majority of doctoral coursework offered online. Through the University of Nebraska-Lincoln Online platform, the Department of Education Administration offers an online Doctor of Education in Educational Administration degree program that meets the needs of professional practitioners interested in obtaining credentials for P-12 administration. The curriculum focuses on understanding challenges and opportunities in a school or district setting, seeing the needs of students and adults, analyzing situations, and formulating approaches and solutions. Graduates complete the program ready for careers as school administrators skilled at building relationships with students, parents, teachers, and community members to cultivate success in their schools. Students in the online Doctor of Education in Educational Administration program must also complete an internship, dissertation, and three one-week on-campus residencies at the University of Nebraska-Lincoln campus in Lincoln, NE. Applicants must hold a current Standard Teaching Certificate from Nebraska or a credential recognized as equivalent to a Nebraska Standard Teaching Certificate. Applicants must also have a minimum of two years of full-time teaching experience at the grade levels relevant to their desired course of study. The College of Education and Human Sciences at the University of Nebraska-Lincoln is accredited by the Teacher Education Accreditation Council (TEAC). The University of Nebraska-Lincoln is accredited by the Higher Learning Commission (HLC). Texas Tech University ranks #2 on The 10 Best Online Doctorate in Educational Adminstration Programs! The College of Education at Texas Tech University offers a number of undergraduate, graduate, and professional programs that focus on developing educators equipped for the 21st century. The College partners with various school district partners, community agencies, and other institutions of higher education to provide relevant learning opportunities for its students. Several centers, institutes, and research initiatives operate under the College of Education, including the Center for Research in Leadership and Education, a hub for collaborative research and practical application partnerships on topics of leadership and inequity, justice, and compassion in a global society. Through the Texas Tech University Online platform, the College of Education offers an online Doctor of Education in Higher Education Administration degree program that allows students to prepare for their career goals in a cohort setting. The curriculum delivers the skills students need to develop as scholarly practitioners who understand the importance of equity and social justice. Graduates complete the program prepared for careers as instructional and administrative professionals for positions in two- and four-year colleges and universities, government agencies, as well as business and industry. Students in the online Doctor of Education in Higher Education Administration program must also complete a dissertation and attend three one-week, in-person professional development sessions at the Texas Tech University campus in Lubbock, TX. Applicants must have full-time professional experience in either a public or private two-year or four-year higher education institution or a state or federal educational agency serving higher education. The College of Education at Texas Tech University is accredited by the National Council for Accreditation of Teacher Education (NCATE). Texas Tech is accredited by the Southern Association of Colleges and Schools Commission on Colleges (SACSCOC). Ball State University ranks #3 on The 10 Best Online Doctorate in Educational Adminstration Programs! The Teachers College at Ball State University offers a number of undergraduate, graduate, and certificate programs for educators looking to study, grow, and succeed in their careers. Within the College, the Department of Educational Leadership offers programs ideal for students seeking leadership roles, from school superintendency to school administration to charter school leadership to research positions within the educational field. Many of the programs offered in both the Teachers College and Department of Educational Leadership offer students the opportunity to gain licensure and certification in addition to their studies. 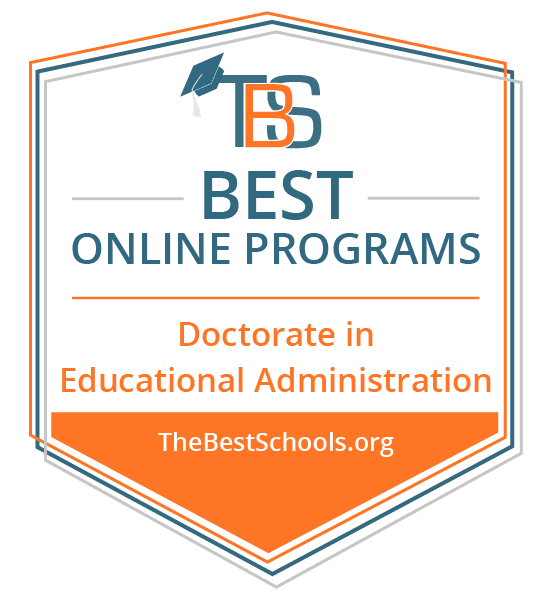 The Department of Educational Leadership offers an online Doctor of Education in Educational Administration and Supervision degree program through the Ball State University Online platform. The program caters to education administrators and professionals dedicated to advancing the profession through quality teaching, research, and service. Students can customize their doctoral program to meet their specific needs by choosing from a variety of minors and by choosing whether or not to pursue Indiana licensure for school superintendency as part of the degree program. Students in the online Doctor of Education in Educational Administration and Supervision program must also complete an internship and dissertation. Applicants to the program must hold a master's degree. The Teachers College at Ball State University is accredited by the National Council for Accreditation of Teacher Education (NCATE). Ball State University is accredited by the Higher Learning Commission (HLC). West Virginia University ranks #4 on The 10 Best Online Doctorate in Educational Adminstration Programs! The Department of Curriculum and Instruction/Literacy Studies at West Virginia University, housed in the College of Education and Human Services, seeks to prepare future educators and administrators who aspire to research, develop, and implement effective and innovative curriculum for students ranging from pre-K to adult. Students can choose from a variety of undergraduate, graduate, and professional programs. The Department houses several research and outreach facilities, several of them focused on technology and 21st century skills. The Department of Curriculum and Instruction/Literacy Studies, through West Virginia University's online platform, offers an online Doctor of Education in Higher Education Administration degree program with concentration options in Curriculum, Assessment, and Academic Affairs, College Student Development, Administration, Organizations, and Policy, and Individualized Specialization. In addition to their specialization courses, students benefit from a variety of perspectives in interdisciplinary core courses with students from other educational leadership programs. Graduates complete the program prepared for positions in higher education administration, faculty and research and policy. Students must also complete an internship, dissertation, and residency at the West Virginia University campus in Morgantown, WV. Applicants must have a 3.0 GPA at all institutions attended and demonstrate evidence of appropriate professional experience that would support the goals and expectations of the program. The College of Education and Human Services at West Virginia University is accredited by the National Council for Accreditation of Teacher Education (NCATE). West Virginia University is accredited by the Higher Learning Commission (HLC). Sam Houston State University ranks #5 on The 10 Best Online Doctorate in Educational Adminstration Programs! The College of Education at Sam Houston State University offers opportunities for study, professional growth, research, collaboration, and community service. The Department of Educational Leadership within the College of Education offers several graduate degrees and certificate programs that prepare professionals to be leaders in a variety of settings, including public schools, libraries, institutions of higher education, and adult education programs. All programs offered by the Department of Educational Leadership include a practical component that allows students to gain training in observation and research techniques, evaluation, and creative problem solving. The Department of Educational Leadership offers an online Doctor of Education in Developmental Education Administration degree program through Sam Houston State University's online platform. The interdisciplinary program in Developmental Education Administration prepares educators to develop and administer programs for underprepared community college and university students. Graduates of this degree program will be able to perform key roles functions, including applying administrative theory to instructional leadership functions, set goals, assigning responsibilities, examining allocation and use of resources, and planning and administering curriculum. Students in the online Doctor of Education in Developmental Education Administration program must also complete an internship, dissertation, and three online mentoring appointments with an advisor per year. The College of Education at Sam Houston State University is accredited by the National Council for Accreditation of Teacher Education (NCATE). Sam Houston State University is accredited by the Southern Association of Colleges and Schools Commission on Colleges (SACSCOC). Indiana State University ranks among The 10 Best Online Doctorate in Educational Adminstration Programs! The Bayh College of Education strives to prepare, promote, and advance education and human service professionals in a diverse and ever-changing world. The College offers a variety of undergraduate, graduate, and professional degrees that prepare educators for a number of career paths. Within the Bayh College of Education, the Department of Educational Leadership offers programs and services that prepare today's practicing educators to be tomorrow's administrative professionals. The Department offers a number of grants, scholarships, and awards to assist students in achieving their educational goals. Through the Indiana State University Online platform, the Department of Educational Leadership offers an online Doctor of Philosophy in Educational Administration degree program with two concentration options, in K-12 School Administration, or Higher Education Leadership. The concentration in K-12 School Administration works ideally for post-educational specialist students who desire a terminal degree preparing them to become scholar and practitioner leaders. The concentration in Higher Education Leadership prepares students for positions of leadership in two- and four-year collegiate institutions, and caters to busy professionals currently working in higher educational settings and looking for a flexible, quality educational experience. Students in the online Doctor of Philosophy in Educational Administration program must also complete an internship and dissertation. Applicants must have a GPA of 3.5 or above on all graduate work attempted and highlight personal and professional contributions to leadership in education in their application. The Bayh College of Education at Indiana State University is accredited by the National Council for Accreditation of Teacher Education (NCATE). Indiana State University is accredited by the Higher Learning Commission (HLC). Governors State University ranks among The 10 Best Online Doctorate in Educational Adminstration Programs! The College of Education at Governors State University commits itself to ensuring that its students become lifelong learners, advocates for diversity and social justice, and equipped to be engaged, effective, transformative educators and mental health professionals. The College of Education has two divisions; the Division of Education offers undergraduate, graduate, and professional degrees to prepare students for careers as educators. The College of Education offers a variety of workshops, professional development opportunities, programs, and services for its students and the community. Through the Governors State University Online platform, the Division of Education, within the College of Education, offers an online Doctor of Education in Interdisciplinary Leadership degree program with a concentration available in Higher Education. The interdisciplinary nature of the program helps students develop the skills to work across different disciplines with ease, continually develop their leadership expertise to keep pace with the rapidly changing world, incorporate research and data-driven decision making in their work, and collaborate effectively with others. The required capstone project gives students an opportunity to plan, implement, complete, and orally defend a comprehensive practicum project. Graduates emerge prepared for careers in higher education, with valuable skills, including organizational and social reform-oriented leadership, ethical practices, strategic planning, budgeting and finance, fundraising, globalization, and community relations. Students in the online Doctor of Education in Interdisciplinary Leadership program must also complete a qualifying examination and capstone project. Applicants must hold a master's degree from an accredited program. The College of Education at Governors State University is accredited by the National Council for Accreditation of Teacher Education (NCATE). Governors State University is accredited by the Higher Learning Commission (HLC). Carson-Newman University ranks among The 10 Best Online Doctorate in Educational Adminstration Programs! The School of Adult and Graduate Studies at Carson-Newman University offers an array of graduate and professional programs to serve the needs of busy adults looking to further their education. The School offers in-person classes and programs at a number of locations in the state of Tennessee, as well as a diverse range of online offerings. Students in the Education programs in the School of Adult and Graduate studies can apply for a number of scholarships, loans, grants, and loan forgiveness programs that seek to make higher education more affordable for teachers. Through the Carson-Newman online platform, the School of Adult and Graduate Studies offers an online Doctor of Education degree program with a concentration in Administrative Leadership. Experienced, licensed teachers with a desire to become leaders in their schools and districts make ideal candidates for this program. The curriculum focuses on analyzing theory and research findings for application in a variety of educational settings, so that graduates emerge well prepared for careers as educators, administrators, and leaders. Students may concurrently obtain a Administrative Licensure Specialization (only valid in TN) while they complete the Doctor of Education with a concentration in Administrative Leadership program. Students must also complete a dissertation. Applicants must submit official transcripts from all previously attended colleges or universities, including the highest degree attained, and must have a minimum of three years of experience teaching in a Pre-K-12 classroom. Applicants must also submit proof of employment in a P-16 setting or a background check. The Education Programs through the School of Adult and Graduate Studies at Carson-Newman University are accredited by the National Council for Accreditation of Teacher Education (NCATE). Carson-Newman University is accredited by the Southern Association of Colleges and Schools Commission on Colleges (SACSCOC). Andrews University ranks among The 10 Best Online Doctorate in Educational Adminstration Programs! The School of Education at Andrews University provides undergraduate, graduate, and professional degree programs based on a Christian worldview to prepare professionals for global service as educators. Within the School, the Department of Leadership houses three distinct yet connected graduate programs: Leadership, Educational Leadership, and Higher Education Administration. The Department shares faculty and classes across these three programs, providing students with interdisciplinary instruction. Through the Andrews University Online platform, the Department of Leadership offers online Doctor of Education and Doctor of Philosophy in Higher Education Administration degree programs. The programs programs prepare professionals who hope to pursue careers and academic positions in teaching and research in colleges and universities, as well as corporate training or policymaking positions at the private and state level. Being more research focused, the Ph.D. program serves those who wish to work in research or teaching, while the Ed.D. program primarily prepares those seeking administrative and executive positions. Students in the online programs must also complete an internship and dissertation. Students must also attend a one-week in-person orientation at the Andrews University campus in Berrien Springs, MI. Applicants must hold a bachelor's and master's degree in a relevant field from an accredited United States institution, or the overseas equivalent. The School of Education at Andrews University is accredited by the National Council for Accreditation of Teacher Education (NCATE). Andrews University is accredited by the Higher Learning Commission (HLC). George Fox University ranks among The 10 Best Online Doctorate in Educational Adminstration Programs! The School of Education at George Fox University offers a variety of in-person and online undergraduate and graduate degrees, as well as certifications, endorsements, and professional degrees. Curriculum draws on Christian principles and encourages academic rigor and spiritual growth. Even in its online programs, the School of Education prides itself on small class sizes, personal attention for students, and a cohort model that allows students to build meaningful professional relationships. Through the George Fox University Online platform, the School of Education offers an online Doctor of Education degree program with a concentration in Administration. The program strives to develop educational leaders and administrators with the knowledge, skills, and dispositions to inspire, educate, and serve others effectively for the common good. The flexible nature of the online Ed.D. degree program provides an ideal solution for principals, vice principals, district office administrators, and superintendents who want to continue working full-time while pursuing further education. Students in the online Doctor of Education program must also complete a dissertation and annual two-week summer residencies at the George Fox University Campus in Newberg, OR. Applicants must hold an approved, regionally accredited bachelor's and master's degree in education or a related field, with a GPA of at least 3.25 on a 4.0 scale. Applicants must also have had at least three years of relevant professional experience. The School of Education at George Fox University is accredited by the National Council for Accreditation of Teacher Education (NCATE). George Fox University is accredited by the Northwest Commission on Colleges and Universities (NWCCU). An educational administration doctoral degree focuses on the leadership and administrative skills needed to successfully lead schools and educational organizations. This list includes both Doctor of Education (Ed.D.) and Doctor of Philosophy (Ph.D.) in Educational Administration degrees. Online Ed.D. programs best serve individuals interested in becoming practitioners in the field of Educational Administration, while an online Ph.D. in Educational Administration works ideally for those that desire to research or teach, particularly at colleges and universities. Both of these degrees prepare graduates for successful careers in educational administration. Individuals who complete a Doctorate in Educational Administration degree program emerge prepared for a number of jobs in school administration and leadership. Many programs offer opportunities for licensure and certification concurrent with completion of the Doctorate in Educational Administration, so students finish the degree equipped with both the technical certification and the skills and knowledge needed to successfully lead academic organizations. This section includes Doctorate in Educational Administration Salary Information. Salary amounts reflect median pay for 2016, sourced from the Bureau of Labor Statistics. ASCD serves the education community as a professional organization committed to excellence in learning, teaching, and leading so that every child can be healthy, safe, engaged, supported, and challenged. They offer publications, events, and professional development opportunities for educators interested in supervision and curriculum development. AASA represents and works for the dreams, educational expertise and concerns of local school system leaders throughout the United States. The organization offers resources and events that support administrative professionals and their school districts. UCEA operates as a consortium of higher education institutions. With a concentrated focus on graduate students, this organization offers a number of resources and networking opportunities for those passionate about leadership in higher education. As an organization, NEA commits itself to advancing the cause of public education throughout the United States. Designed for professionals working anywhere from pre-school to university settings, NEA offers a variety of information, events, and grants to benefit educators and their organizations.